Chrysophytes are a group of algae commonly found in lakes. They are sometimes referred to as golden-brown algae due to their coloration from specific photosynthetic pigments. They are often unicellular and have a flagellum, allowing them to be mobile in the water. There are over 1,000 known species of chrysophytes. Any given lake may have several dozen. Each species has defined optimum and tolerances for specific environmental conditions (pH, salinity, temperature, etc.). Some species have a siliceous scale or plate attached to their cell wall. When scaled-chrysophyte cells die, the scales settle to the bottom of the lake and are preserved in the sediments. This offers scientists the opportunity to retrieve these sediments and reconstruct which chrysophytes were living in the lake over long periods of time. Because we know what environmental conditions each of these species prefer, we can reconstruct the ecological history of the lake by looking at which chrysophytes lived in it over centuries and millennia. ELA Lake 239 is the primary reference lake located at the Experimental Lakes Area. In the far northwestern corner of Ontario lies the Experimental Lakes Area (ELA). The ELA is a natural laboratory of 58 lakes and their watersheds used for limnological research. It was established in 1968 by the Province of Ontario and the Canadian Federal Government for the purpose of experimental studies to inform watershed management. The unique characteristic of ELA is that researchers there conduct whole-lake manipulations, one of the only places in the world where this type of research is conducted. The impact of ELA research is far-reaching and has directly affected the Adirondacks. One of their most notable whole-lake experiments was the experimental acidification of Lake 223 and Lake 302. ELA researchers documented wide scale declines in fish populations and alterations in the aquatic food web. Upon reducing the acid input to the lake they also documented a rapid recovery in water chemistry, but the biological response was not as quick. This directly influenced our understanding of how acid deposition was impacting Adirondack lake ecosystems. AsRA's Science and Stewardship Director, Dr. Brendan Wiltse, collecting a sediment core used to study changes in chrysophyte abundance since pre-industrial times at ELA. AsRA's Science and Stewardship Director, Dr. Brendan Wiltse, recently co-authored a scientific paper with colleagues from Queen's University and the Ontario Ministry of Environment and Climate Change on changes in chrysophyte abundance since pre-industrial times at ELA. This study documented marked increases in colonial scaled-chrysophytes in many lakes over this period of time. This represents a major shift in one of the dominant forms of algae in our lakes. 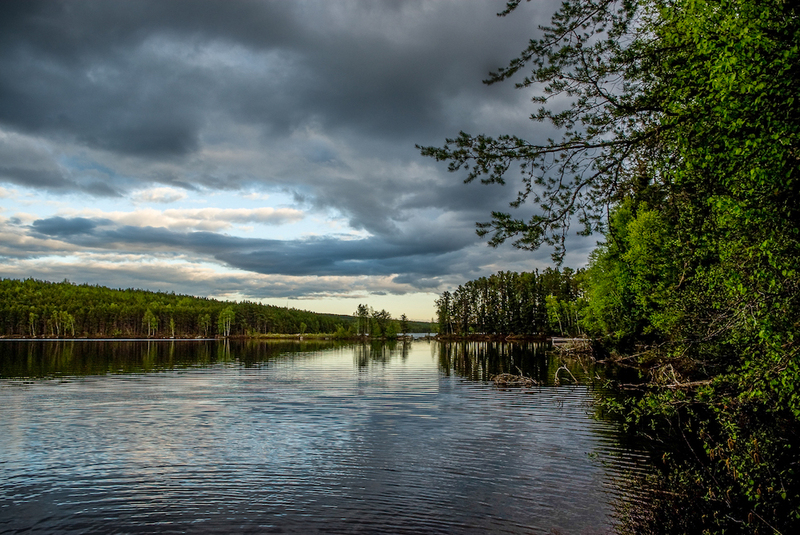 Other colleagues at Queen's have documented similar changes in Adirondack lakes. These changes are believed to be driven by recent climate change influencing lake thermal properties and the flux of important particles and solutes to our lakes. Brendan conducted his doctoral research at ELA and has published other scientific articles on how the minimally disturbed reference lakes found there have changed over time. 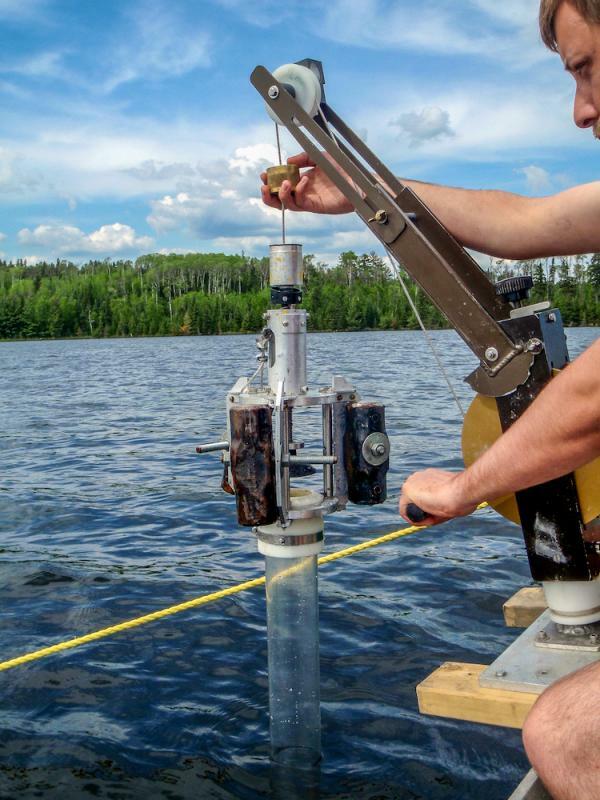 This research is important to our understanding of how climate change is impacting lakes across the temperate region, including in the Ausable River watershed. Brook trout are named Salvelinus fontinalis, meaning the little salmon of the mountain spring.